Anyone wondering whether “words matter” need look no further than Wednesday’s speech by Fed Chairman Jerome Powell, which provided the catalyst for the S&P 500’s (SPX) biggest one-day gain (2.3%) since March, and helped the market put together its best overall week of the year. Wednesday's rally was enough to catapult the SPX to its highest close in two weeks. The gist of Powell’s talk: He left open the possibility that the Fed may not hike rates as aggressively next year, depending on how various economic risk factors play out. Sector action: It was green across the board last week. The top-performing S&P 500 sectors were consumer discretionary (+6.4%), information technology (+6.1%), and health care (+5.9%). The worst-performing sectors were materials (+2.4%), utilities (+2.69%), and real estate (+2.73%). Highlight reel: Wednesday saw Wayfair (W) jump 14.5% and Salesforce.com (CRM) climb 10%, while Tech Data blasted 24% (TECD) higher on Thursday. On the downside, on Thursday Tiffany (TIFF) shed 12% and Quest Diagnostics (DGX) lost 9.24%. Futures watch: Wrapping up its worst month in a decade, crude oil did a lot of dancing around the psychologically important $50/barrel level. January WTI crude oil futures (CLF9) fell to a nearly 14-month low of $49.41 early on Thursday but rallied to close above $51, then dipped below $50 again on Friday before closing out the week a little below $51. The cyrpto rout hit a new low: December bitcoin futures (BTCZ8) dropped to $3,505 last Monday—more than 80% below December 2017 levels—before ending the week around $3,930. 2018’s last hurrah: It’s December, which since 1960 has had the S&P 500’s highest average monthly return (+1.47%). In the most recent 25 years, however, December’s 1.29% average return has been fairly middle of the road, checking in at no. 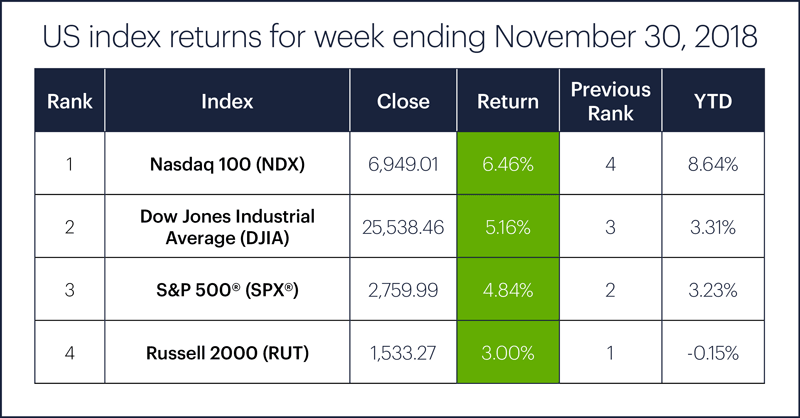 5, even though the month has closed higher 19 times (76% of the time). Also, since 1960 the SPX has closed lower on the first trading of December (today) more often than it has closed higher (55% down vs. 45% up)—the only month besides August with that distinction. 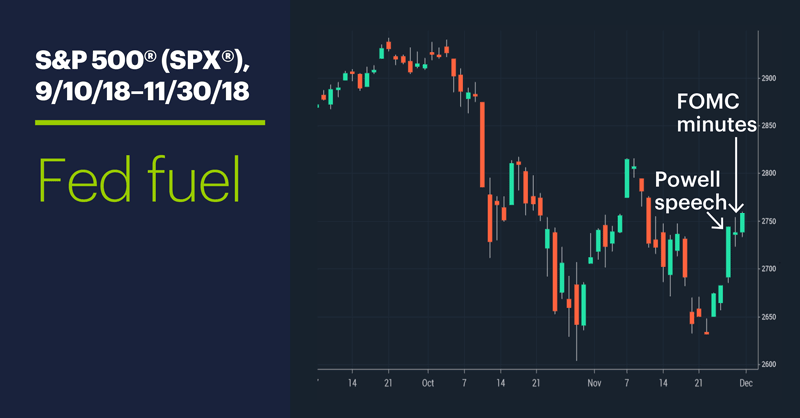 This time, though, the news out of Buenos Aires will likely dictate whether this tendency plays out today—and whether this December keeps up its generally bullish ways. 1 CNBC.com. Dow rises 100 points on hopes of a US-China trade deal at G-20 summit. 11/30/18.